The Highschool Championship is a tournament environment limited to Japan where different highschool teams compete against each other in a series of Challenges. The winning teams are invited to the actual Championship to determine the best team each year which will be awarded with three booster boxes of the latest set and every set released thereafter for one year. Other teams receive a number of booster packs as well according to their place. In addition, in 2003 a life counter was given out to each participant of the Challenges. 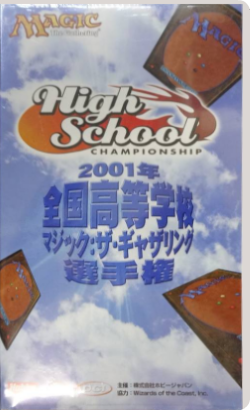 001 Highschool Championship Life Counter 2004 Highschool Championship Challenge participation bonus 2004-?